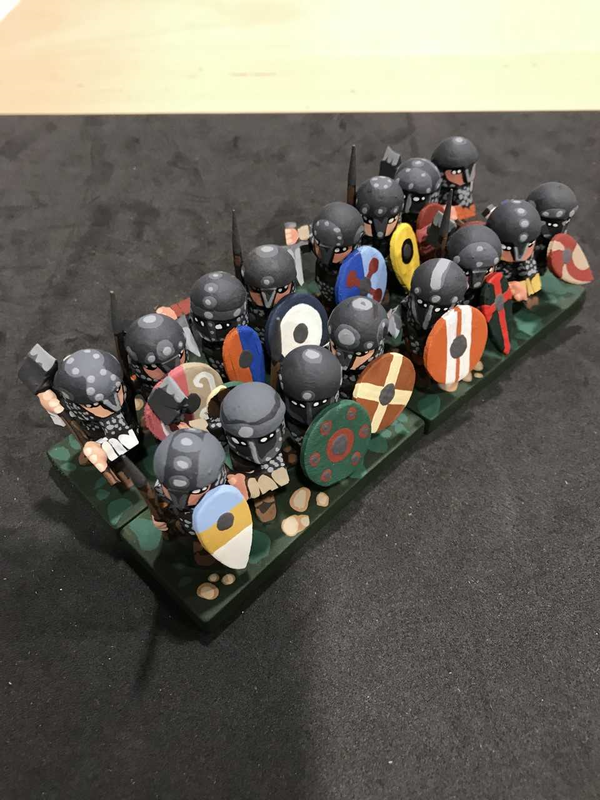 Wooden Warriors: Saxon Huscarls Unit! 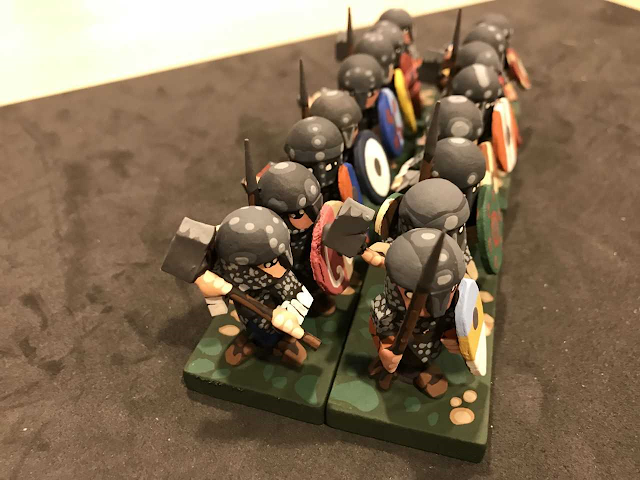 Real life has been incredibly busy this fall so I haven't been able to get as much hobby time as I would have liked, but I finally got my first unit of Saxon Huscarls done for my Hastings game. Here are some of my standard shots of them. 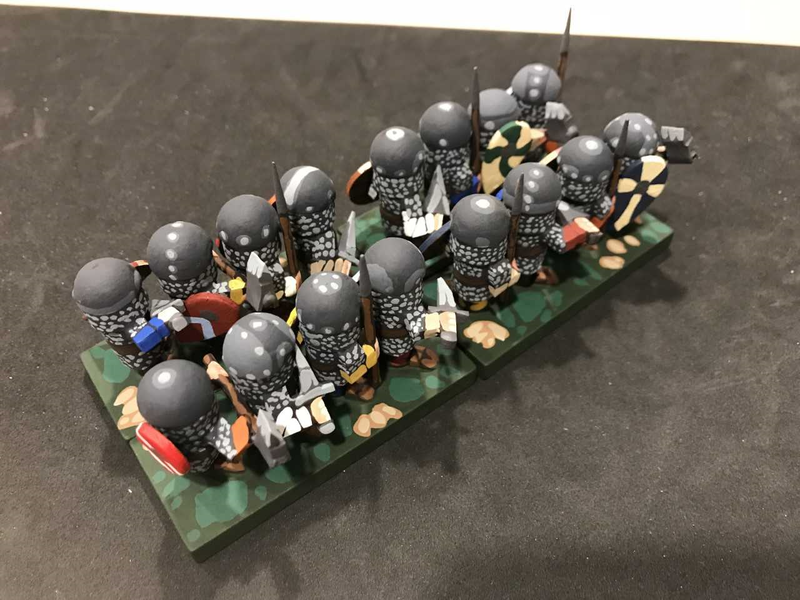 They are very similar construction wise to the previous Dark Ages infantry I've been doing but there are some differences. First, I wanted to put some face masks on some of them to help me tell the difference between them and, say, the Norman allies. I may also go back and paint some facial hair on them too, but I'm not sure I'm going to do that. I also put a mixture of round and kite shields in the unit, which also makes it easier to tell them apart from the Norman side (I use only the kite shields for them). I also gave them a greater mix of weapons with spears, swords, and two-handed Dane axes. The face shields were easy, I just fashioned them out of paper and glued them onto the head. The top part of the shield was a straight edge so that it would lay flush against the bottom of the helmet piece, and I creased the center so that it would have some 3D effect that is consistent with the way they were constructed, at least as far as I can tell from the pictures I looked at. I also angled the shield arms a bit away from the body so that it looks like they are holding their shields out to accept a charge, the bottom part of the shield sticking out further than the top part. It also keeps the shields from being perfectly parallel with the body, which is not very natural in terms of how people really hold a shield, at least for any length of time. I like how they turned out, they are "regular" enough in their appearance to denote skill and training which of course would be a part of a more elite Huscarl unit, and "chaotic" enough in their weapon choices, shield types, and arm positions to convey their ferocity when in actual combat. 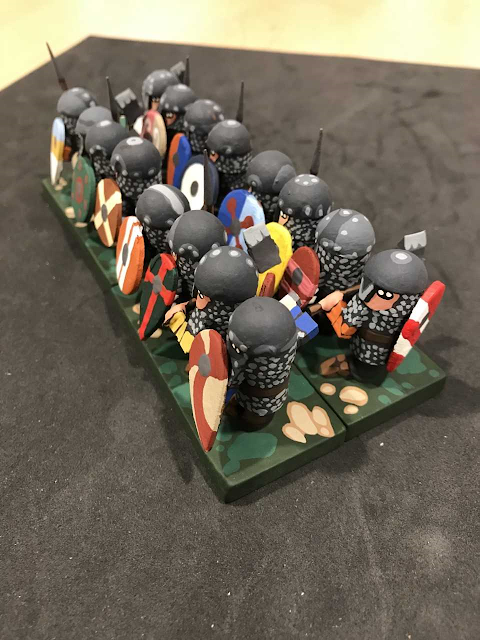 Now onto another Norman allies unit and one more Fyrd and I will have one entire wing for both sides finished! They look great. I am working on an Anglo-Saxon force too, but to fight my Anglo-Danes using the Saga rules. When you researched the Huscarls did you see any evidence of mailed or gloved hands? It seems like all of yours are bare-handed. Just curious. That's a good question, Dale. Most of what I look at are artist's renderings, and many of them are bare handed. However, I think that is likely not as common as it is depicted in artwork. I doubt there would be too many with mailed gloves, but there were probably some. I think most of them probably wore leather gauntlets of some type, it's just that the leather may not have survived the ravages of time and are not necessarily a reliable part of the archeological record which is why you don't see them wearing gloves in most of the artist's works. That said, I find it more likely that they would wear some sort of hand covering with leather or thick fabric gloves being the most common. But to answer your question more specifically, I didn't find much one way or the other in terms of gloves vs. no gloves. I just find it hard to believe that they wouldn't wear gloves given that we know they wore them while working metal and wood. You would think they would wear them in battle as well, at least I think so.